Update! 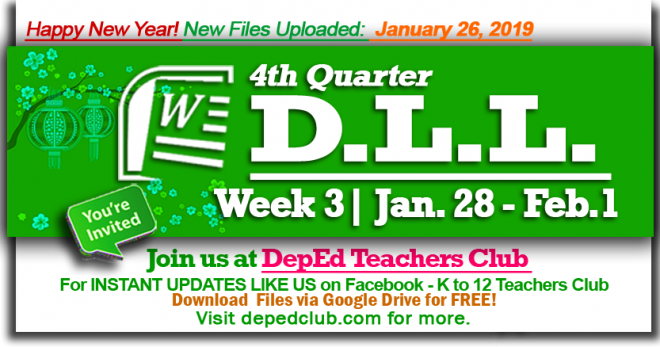 Week 3 – 4th Quarter Daily Lesson Log (January 28 – February 1, 2019) | Weekly DLL are now available. For K-6, we are almost complete in uploading Daily Lesson Logs. Yet, we will keep on uploading new versions of DLL’s every week. Also, some DLL’s may be incomplete in some higher grade levels. We will be uploading the additional DLL’s soon. Some DLL’s are still on the process of editing and formatting. Please take time to visit our website from time to time for the newly uploaded unannounced K-12 Daily Lesson Logs. There is no distinction between the duties of one teaching position and those of other teaching positions. All are involved in classroom teaching. Hence, teaching positions are classified based on the personal qualifications of the incumbents thereof rather than based on the preponderant duties and responsibilities and qualification requirements of the positions. This concept deviates from existing standards that work assignments determine the classification and pay levels of positions. The deviation is made in the case of teachers to encourage and reward initiatives for professional growth which are vital in a dynamic educational system. The progression to a higher position level, which does not entail an increase in duties and responsibilities, recognizes the increase in the academic preparation level. The Career Progression System for Public School Teachers attaches a premium to classroom effectiveness and allows teachers to remain in the classroom while advancing in status and compensation. The system provides for equivalence in duties, recognition and compensation for whatever career line a teacher chooses. which falls under the teaching career line. There are established qualitative and quantitative criteria for each level of Master Teacher. An applicant must possess all the prescribed qualifications to be considered for a particular level which is measured in terms of educational preparation, performance rating, and teaching experience. Master Teacher I positions shall not exceed 6.6% of the total number of authorized teaching positions. Master Teacher II positions shall not exceed 3.4% of the number of authorized Master Teacher I positions. For secondary schools: One (1) Master Teacher position regardless of level may be allowed per subject area with at least 5-7 authorized teacher positions within the school. All Master Teachers shall be administratively under the school heads where they are assigned notwithstanding their rank and salary. Master Teachers shall have regular teaching loads. Master Teachers shall guide other teachers in the school or district towards improving their competencies as well as taking the lead in the preparation of instructional materials. Master Teachers shall serve as demonstration teachers or teacher consultants in other schools in the district. At least 25 points in leadership and potential, or has been a demonstration teacher in the district level plus 15 points in leadership and potential. At least 30 points in leadership, potential and achievement; or has been a demonstration teacher in the division level plus 20 points in leadership and potential, provided the activities or accomplishments listed for this purpose had not been credited or used for similar promotions. Bachelor’s degree for teachers or equivalent plus at least 20 graduate units and at least 18 credit allowances. At least 45 points in leadership, potential and achievement, provided the activities or accomplishments cited for this purpose had not been credited for an earlier promotion. At least 60 points in leadership, potential, and achievements provided the accomplishments and achievements cited for this purpose had not been credited for an earlier promotion. Requests for reclassification of teaching positions to Master Teacher I and from Master Teacher I to Master Teacher II shall be supported by the plantilla and the pertinent evaluation documents. It shall then be reviewed and verified by the DBM RO concerned, subject to the budget rules and regulations on release of funds prescribed under National Budget Circular No. 303 and National Compensation Circular No. 24, respectively. The second career line is school administration which covers Head Teachers and School Principals. Item E (12), Section 7, Chapter I of Republic Act (RA) 9155. provides that the selection, promotion and designation of school heads shall be anchored on the principles of merit, competence, fitness and equality, rather than on the number of teachers/learning facilitators and learners in the school. Promotion to higher Head Teacher (HT) and Principal positions shall be an open ranking basis where merit and fitness are the main consideration and not the position. The detailed guidelines on the selection, promotion and designation of school heads are provided under DepEd Administrative Order (AO) No. 85, s. 2003 dated November 27, 2003 (Annex B). The modified qualification standards for Head Teacher and Principal positions are prescribed under Civil Service Commission (CSC) Resolution No. 040863 promulgated on July 28, 2004 (Annex C).